+Kevin Crawford is what ever Kickstarter creator should seek to be - the ultimate professional who delivers his Kickstarters early and at an amazing value. Part of that value is that he consistently gives back to the community with free releases like The Sandbox #2. What do you get with The Sandbox #2? Behold the second issue of The Sandbox, a free irregular journal from Kevin Crawford and Sine Nomine Publishing. Sine Nomine fans have noticed the regular flow of freebie material I've produced, such as the Mandate Archive series for Stars Without Number, Black Streams for the Red Tide setting, and other free releases for other systems and particulars. 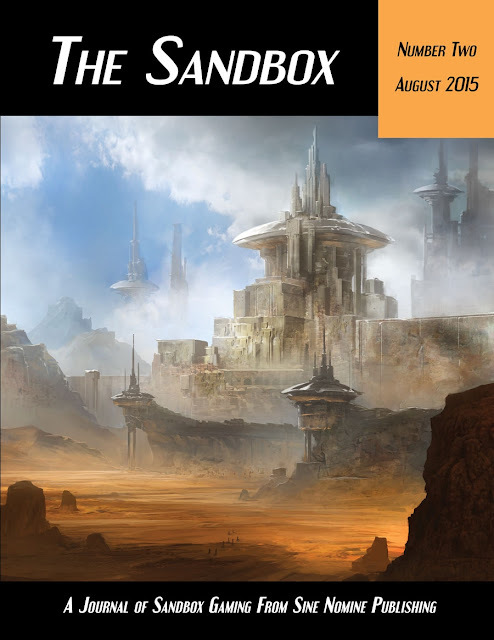 The Sandbox is an umbrella for these free resources, packed with the short articles, quick-roll tables, and GM helps that others have found so useful. The Blademaster, a new character class for Scarlet Heroes and similar old-school-inspired games. Learn the secret arts of the ancient schools of war and wield their ineffable powers in battle. It comes with guidelines and tips for creating your own blademaster schools personalized for your own campaigns. Quick Temples and Shrines is a one-roll generator for quickly generating a temple or fane for your freshly-brewed planet or time-lost city. Discover the problems that raddle the priests and the friends and foes that might complicate a PC's pilgrimage. Quick Religious Revolts will help a GM discover the details behind a recent uprising of some oppressed faith or the savage revolt of a sect of zealous fanatics. If your PCs are unlucky, they might just be able to get front-row seats to the festivities. You can't get a better price than free. Even if you don't use Sine Nomine products (and if you don't own them, why? Stars Without Number is free too) there is a ton of inspiration here that can take you down your own paths. What were the Big Gen Con Releases this Year?